The Australian Future fund is tasked with delivering high risk-adjusted returns on public funds, such as the Australian Government’s budget surpluses, in order to cover the Government’s unfunded superannuation liability arising from entitlements to public servants and defence personnel. This attitude towards uncertainty is not atypical: numerous news commentators have cited uncertainty about the severity of climate change in support of their stance against taking any mitigative action. In a nutshell, the logic of this position can be condensed to “there is so much uncertainty that I am certain there isn’t a problem.” How logical is this position? Can we conclude from the existence of uncertainty that there certainly is no problem? Uncertainty should make us worry more than certainty, because uncertainty means that things can be worse than our best guess. Today’s post expands on this point below, by showing that in the case of climate change, uncertainty is asymmetrical and things are more likely to be worse, rather than better, than expected. In the second post, I will show that it is a nearly inescapable mathematical constraint that greater uncertainty about the future evolution of the climate necessarily translates into greater expected damage cost. Finally, the presence of uncertainty does not negate the urgency of mitigative action. There may be uncertainty about our carbon budget—that is, the amount of greenhouse gasses we can emit before we are likely to exceed temperature increases that are deemed “safe”—but the implications of there being a budget are that delaying mitigative action will necessarily end up being more costly later. 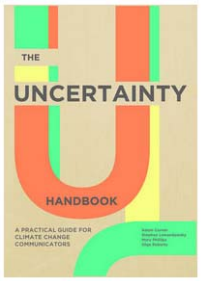 What does uncertainty mean in the context of climate change? Although the word uncertainty has been used in many different contexts, a good definition is to equate uncertainty with imprecision in our best estimate of the future evolution of the climate. In particular, I focus on the likely “sensitivity” of the climate, which refers to the expected increase in global temperatures in response to a doubling of CO2 from pre-industrial levels. According to best current estimates, climate sensitivity is anywhere between 2 degrees (Celsius) and 4.5 degrees, with a best estimate of about 3 degrees. Because an eventual doubling of CO2 from pre-industrial levels (~275 ppm) cannot be ruled out, given today’s concentration of ~392 ppm and the on-going increase of 2 ppm per year, this estimate of climate sensitivity is also a good estimate of the temperature increase from pre-industrial levels that we may experience towards the end of the century. Without going any further, we can already draw one conclusion from this fact: If our best guess of climate sensitivity is 3 degrees, and the uncertainty range is 2-4.5, then things could be worse than expected. We expect 3 degrees but might get 4.5—of course, we could also get as “little” as 2, but we are ignoring the vast majority of possible outcomes if we assume (or hope) that we will “only” get 2 degrees. So clearly, uncertainty means that things could be worse than anticipated. But the problem does not end there. There are two additional aspects of uncertainty that we need to consider. First, we must consider the distribution of climate sensitivity estimates. We know that there is a “best” (mean) estimate, and we know that there is a range of most likely values. But it turns out that climate scientists can do better than that: they can provide a distribution of possible values of climate sensitivity which attaches a probability of occurrence to a range of possible values. 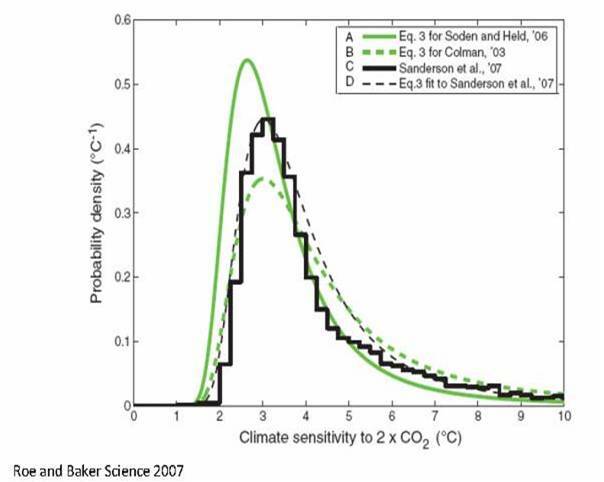 The figure below shows the distribution of climate sensitivity, taken from a paper by Roe and Baker (2007). For present purposes, the most crucial aspect of the figure is its asymmetry: It has a “fat” upper tail and a fairly skinny lower tail. That is, there is little likelihood that climate sensitivity will turn out to be more than 1 degree less than the best estimate of around 3-3.5 degrees (i.e. there is little chance of it being below 2), but there is a considerable chance of it being more than 1 degree above that value—note how it is not inconceivable that it might be as high as 5 or even 6 degrees. There are some very good—and intellectually fascinating—reasons for why the climate sensitivity distribution is asymmetric and has a fat upper tail, but they are beyond the present scope. 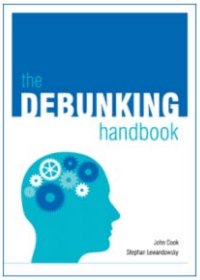 Interested readers may want to consult Roe and Baker (2007) or Roe and Armour (2011). (For a critique of the work by Roe and colleagues, see Zaliapin & Ghil, 2010, 2011.Their critique does not affect the presence of fat tails, only the generality of the reasons underlying its occurrence). So uncertainty doesn’t just mean that things could be worse than anticipated—in the case of climate, chances are that things will be worse rather than better than anticipated. But remember, the problem does not end there. We have to consider one more aspect of uncertainty in climate sensitivity. This final consideration concerns the effects of the magnitude of uncertainty. All other things being equal, should we be more worried by greater uncertainty or less worried? If scientists had really down-played uncertainty—as some commentators have insinuated—what would the effects be? What if uncertainty is actually greater than scientists think? The answer is fairly straightforward, and it is illustrated in the figure below using a statistical Monte Carlo simulation. The four panels in the figure contain synthetic (i.e., simulated) data that are sampled from a “lognormal” distribution—so if you took the log of the values and then plotted them, they would take on the familiar bell shape. I used a lognormal distribution because it has the fat-tail property that we know is an attribute of climate sensitivity. To make my point, I ensured that the mean of the four distributions is identical (around 3, with a tiny amount of deviation introduced by the simulation). However, the standard deviations (spread) of the distributions differ considerably, from .49 in the top left to 2.6 in the bottom right. The spread of each distribution characterizes the extent of uncertainty surrounding the mean estimate of 3 degrees. What are the consequences of increasing uncertainty? The consequences are indicated by the red line at the 5 degree mark in each panel. This represents a temperature increase that would indeed be nothing short of catastrophic in light of suggestions that any temperature rise beyond 2 degrees would be extremely difficult to cope with (Richardson et al., 2009). It is obvious from the figure that the probability of a truly catastrophic outcome increases with uncertainty; from a small .07% in the top left to a concerning 14% in the bottom right. That’s a 200-fold increase in the likelihood of a catastrophic outcome when uncertainty increases from .49 to 2.6. So uncertainty means things could be worse than anticipated. Uncertainty in climate evolution means things are likely to be worse, rather than better, than anticipated. And the greater the uncertainty, the more likely we could be faced with some very serious consequences. Unlike the Chairman of the Australian Futures Fund, the real uncertainty professionals know this. Which is why Munich Re, a reinsurance behemoth, has identified climate change as one of the greatest risks facing mankind. Richardson, K. et al., (2009). Climate Change: Global Risks, Challenges & Decisions. 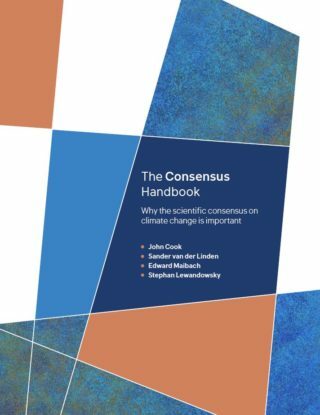 Synthesis Report of the Copenhagen Climate Congress. (University of Copenhagen). Roe, G. H. & Armour, K. C. (2011). 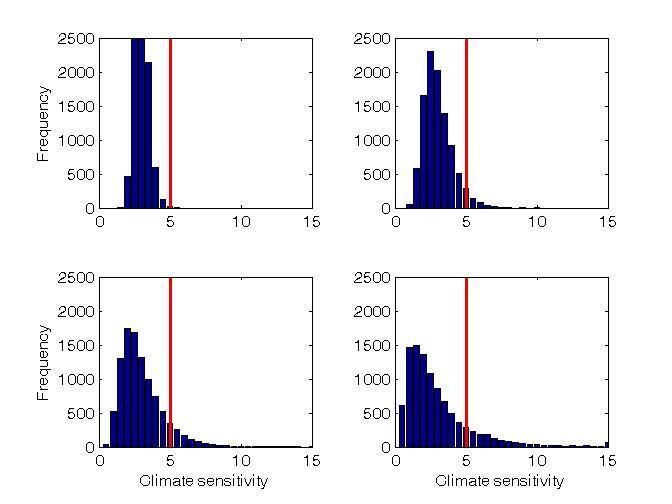 How sensitive is climate sensitivity? Geophysical Research Letters, 38, L14708. Roe, G. H. & Baker, M. B. (2007). Why Is Climate Sensitivity So Unpredictable? Science, 318, 629-632. Zaliapin, I. & Ghil, M. (2010). Another look at climate sensitivity. Nonlinear Processes in Geophysics, 17, 113-122. Zaliapin, I. & Ghil, M. (2011). Reply to Roe and Baker’s comment on “Another look at climate sensitivity” by Zaliapin and Ghil (2010). Nonlinear Processes in Geophysics, 18, 129-131.